Vietnam is one of the few countries that come to mind when asked to think of Asia. It’s well known for its food, culture, and majestic landscapes. Since Vietnam was a French colony for 70 years, some elements of their culture, namely the language, has remained in some parts of the population. This makes it a frequent destination for French-speaking tourists and foreign nationals from countries such as France and Canada. Many choose to extend their involvement with Vietnam by applying for citizenship, getting married in Vietnam, opening subsidiaries in Vietnam, or trading with Vietnamese companies. Whether for personal or corporate reasons, there are many situations where you will be asked to provide a series of Canadian documents for use in Vietnam. This can include certificates of incorporation, articles of incorporation, corporate board resolutions, birth certificates, marriage certificates and police checks. These documents cannot simply be accepted in their original form as the Vietnamese government cannot be expected to be familiar with all manner of Canadian documents. This is why a verification process exists. Whereas Vietnam and dozens of other countries use the apostille process, Canada has not signed the Hague apostille convention. This can be confusing as you might have been told to get a Canadian apostille for Vietnam. This is not possible but there is an equivalent process that is equal to an apostille and it is known as authentication and legalization. If you have Canadian documents that need to be used in Vietnam or elsewhere, you will need to go through this process to make them valid for use in that country. Authentication and legalization involves validating the signatures of authorized individuals. Authentication takes place at Global Affairs Canada and legalization takes place at the consular section of the Embassy of Vietnam in Canada, both of which are here in Ottawa. Prior to beginning this process, your Canadian documents must have a signature recognized by Global Affairs Canada to be valid for authentication. These include the signatures of Canadian lawyers, notary publics, signatories at the various provincial authentication offices, and select members of the RCMP. If your Canadian document contains one of these signatures and also meets their additional requirements, one of their agents place their stamp, seal, and signature which authenticates your Canadian document. 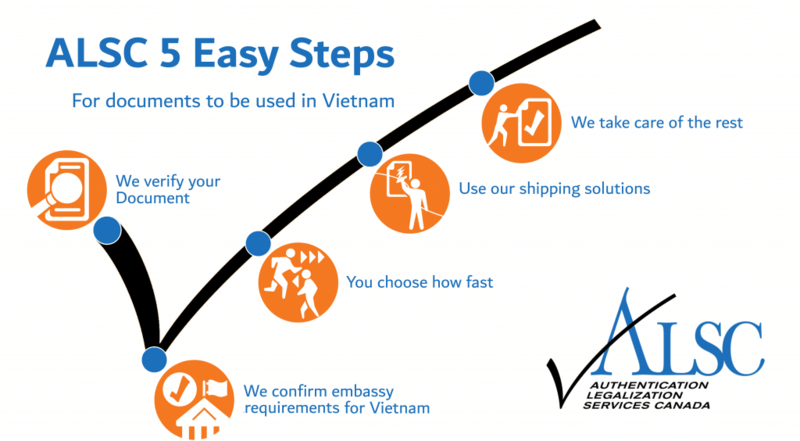 Once this step has been completed, you will have to put together a series of requirements detailed by the Vietnamese embassy for them to accept your documents. These can include additional documents as well as fees which are subject to frequent changes. Upon providing all of the appropriate requirements and fees, the consul at the consular section of the Vietnamese embassy will place his or her stamp, seal, and signature which legalizes your Canadian document, making your Canadian document valid for use in Vietnam. The entire process of authentication and legalization can take over a month to complete. This is because authentication at Global Affairs Canada can take up to 20 business days for documents they receive by mail or courier, and the processing time for legalization at the Vietnamese embassy can vary considerably as well. Delays are very common and it’s easy to make a mistake or miss a requirement when there are so many factors to keep track of. This long and uncertain processing time can be a very big problem when there are strict deadlines that need to be met for your affairs in Vietnam. Thankfully, there is a way to reduce your processing time and substantially reduce your chances of delay: trust ALSC, the authentication and legalization experts. Since our foundation over 25 years ago we have helped thousands of Canadian individuals and businesses process their Canadian documents for use in Vietnam. From corporate powers of attorney, certificate of pharmaceutical products, and manufacturer’s certificates to police checks, pension letters, and birth certificates, we know exactly what you will need to make them ready for use in Vietnam and over 100 other countries around the world. As the pioneers in our industry, we developed processes which have become the industry standards. We offer three service speeds which are designed to save you time at an affordable cost. Regardless of which service speed you choose, you receive our service guarantee: we will ensure your documents will be made valid for use in Vietnam or elsewhere. Our priority same day authentication service saves you up to 20 business days by having your documents authenticated at Global Affairs Canada the same day they arrive at our office. We also offer a standard 3 business day and economy 10 business day services which are ideal for those processing multiple documents on a budget. When you choose to use our services, one of our experts will help you put together the necessary requirements for legalization at the consular section of the embassy of Vietnam located minutes away from our office. Once we have received your documents and any necessary requirements, you sit back while we provide you with detailed updates at every stage. Our agents will be available at all times during our office hours to answer any questions and address any concerns you may have throughout the process. Upon completion we can ship your documents to the destination of your choice through one of our many trusted shipping partners. If you have Canadian documents for use in Vietnam and are rushing to meet a deadline, we strongly recommend you contact us sooner rather than later. In the meantime, feel free to continue reading for more details about some Canadian documents commonly used in Vietnam, how to get them, and how we can help. Canadian corporate documents such as certificate of incorporation, articles of incorporation, articles of amendment, or international trade certificates can be requested for a variety of reasons for use in Vietnam. These include things such as modifying an existing subsidiary in Vietnam, partnering with a Vietnamese corporation, or exporting your Canadian products for sale in Vietnam. The exact corporate documents you will require will depend entirely on the demands of your requesting party or affiliate in Vietnam. It is strongly recommended that you clarify exactly which documents you will need since miscommunication is the most common cause of delay. Indeed, every year dozens of our corporate clients turn back to us at the last minute realizing they were missing some documents in their initial use of our services. As an existing business, it is likely you already have many of the required documents on file or know where and how to get them. If you already have your necessary Canadian corporate documents for use in Vietnam, take a moment to check if the stamp, seal, and signature of the lawyer or notary public match and that the name is legible. This is another common point of delay since Global Affairs Canada cannot authenticate your corporate documents if the notarization has been done incorrectly or if the signatory cannot be identified. If you have a power of attorney, whether personal or corporate, please note that we cannot assist you with the legalization step at the Vietnamese embassy. This is because they have additional and extensive requirements which must be completed by yourself which we cannot do for you. We can still assist you with the authentication of your power of attorney for use in Vietnam. When it comes to personal affairs such as citizenship, employment, getting married in Vietnam, or resolving inheritance matters in Vietnam, there are a series of personal documents that will likely be requested of you for use in Vietnam. These usually involve some manner of Canadian Vital Statistics documents such as birth certificates, marriage certificates, or death certificates. In contrast to many other Canadian documents, Canadian vital statistics documents are issued with signatures that are recognized by Global Affairs Canada which makes them valid for authentication right away. There are a few things to remember when preparing your Canadian birth certificate, marriage certificate, or death certificate for use in Vietnam. First, your documents must come from the provincial vital statistics office of the province where the life event occurred. This means that marriage certificates issued by the church and death certificates issued by the funeral home cannot be authenticated even if they have been notarized by a Canadian lawyer or notary public. Second, although you can make notarized copies of your Canadian vital statistics documents it is not recommended since originals are always preferred for processing and notarized copies are not always accepted by requesting parties in Vietnam. You should always check with your requesting party to see if originals are required or if notarized copies will suffice. Furthermore, making a notarized copy can sometimes be more expensive than simply ordering a new Canadian birth certificate, marriage certificate, or death certificate. Finally, make sure your Canadian vital statistics document is in long form or certificate sized where applicable. This typically applies to birth certificates which can be offered in either wallet-sized, certificate sized, or long form versions. The long form versions can be referred to as a Copy of An Act of Birth or Registration of Live Birth depending on the issuing province. Wallet-sized birth certificates cannot even be authenticated and should therefore cannot be used for foreign affairs in Vietnam or elsewhere. If you cannot find your Canadian vital statistics document or do not have the correct type, its very easy to order a new one from the appropriate vital statistics office and can be done so using the helpful links below. Many of our clients choose to have their new birth certificate, marriage certificate, or death certificate sent directly to our office to save processing time. We recommend you do the same if you are in a rush! If you have affairs in Vietnam related to employment or immigration, it is likely that you will be asked to provide a Canadian police check for use in Vietnam. There are hundreds of local police checks you can acquire and these will need to be notarized by a lawyer or notary public to be valid for authentication at Global Affairs Canada. However, be cautious when using locally issued police checks since there are many cases where requesting parties in Vietnam will not accept them. This is because they are based only on name and date of birth which makes them susceptible to error. In contrast, RCMP police checks issued from their headquarters here in Ottawa also include fingerprints which provides a more thorough background check. The RCMP is also recognized internationally which makes their police checks preferred by most foreign officials around the world. Finally, police checks issued from the RCMP headquarters contain signatures that are recognized by Global Affairs Canada which makes them valid for authentication upon issuance. This saves you the cost of notarization and also allows you to save processing time if you choose to have your RCMP police check sent directly to our office for processing when you order it. If you would like to get your RCMP police check, you can start by following the steps listed here. Addressing your affairs in Vietnam can feel like an impossible task at times. Although simple in theory, authentication and legalization is very difficult to do properly even for those who are familiar with the process. The amount of time it takes to plan out and execute this process is simply not worth the effort for many people. Indeed, going through the authentication and legalization process on your own is comparable to taking on a part-time job on the side. This is why every year thousands choose our services. Our commitment to quality service has earned us a proud membership with the Canadian Chamber of Commerce, and A+ rating with the BBB, and dozens of 5-star reviews on Facebook and Google from our satisfied clients from all over the world. As the leaders in our industry, we are always looking for ways to further streamline the process to make it more convenient for our current and future clients. One of the ways in which we have done this in recent years is by opening over a dozen service centers across Canada in Surrey, Calgary, Edmonton, Regina, North York, Vancouver, Victoria, Mississauga, Halifax, Winnipeg, Toronto and Montreal. Once you have confirmed use of our services, you can make an appointment through our head office and save yourself a trip to the post office and drop your documents off at any one of our service centers instead. When you do this, your documents receive free shipping via FedEx to our head office in Ottawa for processing and can be shipped back to any one of our service centers for pick up upon completion, also free of charge. Alternatively, we can ship your documents anywhere else in the world you need them to go at an affordable rate. Save your time and your money in the long run by trusting the experts at ALSC with your Canadian documents for use in Vietnam. Click below to get started now!